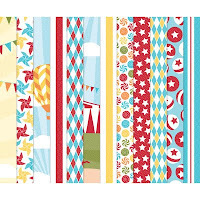 Trinity Designs: Glittering Big Top Birthday! Can I just tell ya', I am so happy for this weekend to finally be here! Guess what we are doing tonight?!! We are going to the Kennedy Center to see the Broadway production of "Wicked"!! I've been looking forward to this since my birthday in May since our friends Angie and Chris gave me my ticket as a gift! This is also Angie's birthday weekend, so all five of us are going together and having dinner at a D.C. landmark, the Old Ebbitt Grill. Needless to say, this day can't pass fast enough for me! 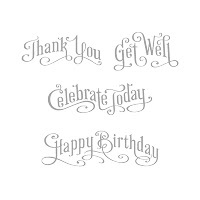 So, since we are celebrating birthdays around here tonight, I thought a fun birthday card would be just the ticket to share with you today! 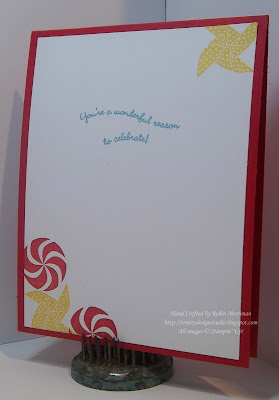 We made this one last night at my Stampin' at the Firehouse card class and all the stampers loved it! This card has the Big Top Birthday Designer Series Paper as the star and rightfully so, it's awesomely bright and fun! 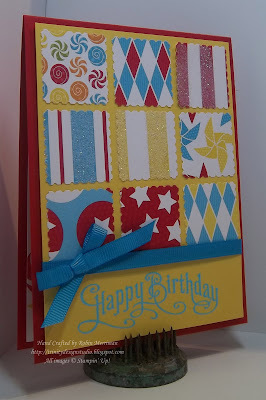 I had seen a similar card on Sharon Burkert's blog and loved the layout of the paper squares she used. I put my own twist on the card design and now the only thing the same is the layout and the Designer Paper! That's part of the fun of stamping, taking a great idea and making it your own. Here, take a closer look, I made my own glitter paper! Yep, the squares that have stripes were fancied up with our 2 Way Glue Pen and Dazzling Diamonds Glitter. It's so easy to do and adds fantastic detail! This card is super simple from start to finish - the card base is Real Red and the layer is Daffodil Delight. 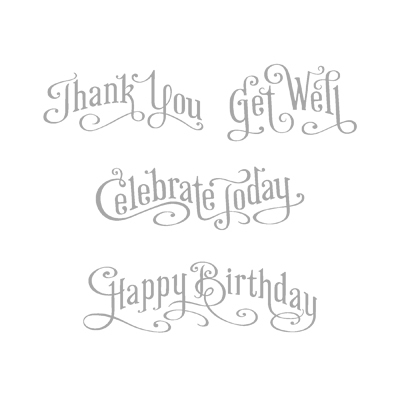 I used one of my new favorite stamp sets, Perfectly Penned, for the greeting. 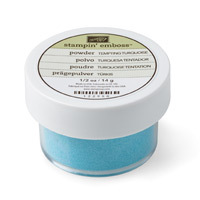 It was stamped with Versamark ink and then heat embossed with the bright, new Tempting Turquoise Embossing Powder. 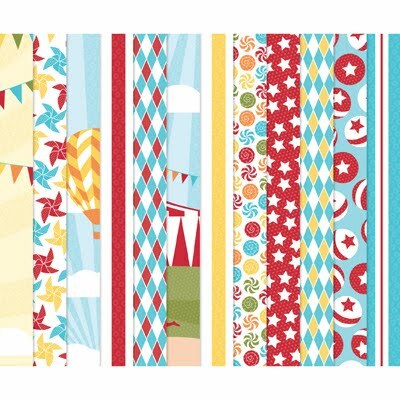 LOVE how this looks on the Daffodil Delight cardstock! All the Designer Paper squares were punched out with the Postage Stamp Punch which was new in the Summer Mini, but yay! carried over into the big Idea Book and Catalog! Once the squares were punched they were laid out in the grid pattern starting with the upper left corner. Place the upper right corner next and the rest are very easy to lay out, keeping the spacing even all the way through. Next the glitter was added with the 2 Way Glue Pen and the card front was finished off with Tempting Turquoise 1/4" Grosgrain ribbon wrapped around and topped with a sweet little bow. Pretty simply done, I used the new Sweets for the Sweet stamp set that I was gifted with on the Alaska Cruise - so stinkin' cute! Real Red peppermints, Daffodil Delight pinwheels and a birthday greeting from the Curvy Verses stamp set all on a Whisper White background. That was the icing on the cake for this very fun card! See how Designer Paper can really jazz up your projects? 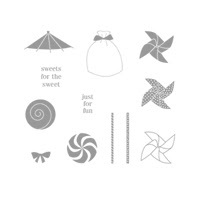 It's an awesome tool to have in your creative arsenal and with all the different designs that are available - that ALL coordinate with Stampin' Up! colors and designs - your paper crafting can be SO easy! Normally our Designer Paper is just .91 per sheet (12 sheet packs), but with this sale, it's just .68 per sheet! I love a deal like that! I hope you enjoyed today's project! I had a great time making it. Have a wonderful weekend stampin' friends, I hope you have time to make something fun. Pull out your Designer Paper and see what you can do with it! Absolutely adorable, love the different dp squares, great job.